In a prior post, we spoke about a logo design that we were completing for Christi at Johnson’s CPR Plus. Shortly after the logo was completed, the website was also just completed. Christi provided us the information very quickly for the material she wanted on her site. We had the site most done within 48 hours of the information being received. Over the course of a few days, we made other final adjustments and modifications to the website while awaiting the logo. Once the logo was done, it was added to the site and Christi said everything looked great! Her website is a basic three page site with a basic contact form and PayPal integration. 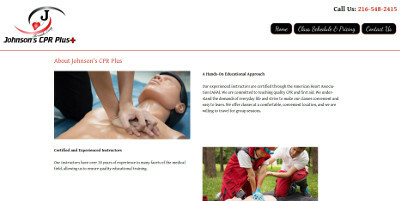 The website for Johnson’s CPR Plus is at johnsonscprplus.com. Phillip, a current customer of BsnTech with a few other websites, reached out to us for help with a company website that he was involved in. Originally, they had another individual helping to get the website created but the development process stalled and they needed someone that was going to work quickly to get the site completed. Originally the scope of the work was to help overhaul the website and setup the design. During the process, however, they were fed up with their hosting provider with the slow page response and trouble with file permissions. Therefore, we worked to copy over the entire website to our hosting platform which dramatically increased the speed of their site. Over the course of a couple months, we worked closely with Phillip to make each of the pages and create templates so they could go through and fill in the page details to save on cost. This was also good practice for them to be able to manage their website themselves as well. Thank you to Phillip for giving us this opportunity to help with the website design and website hosting needs! 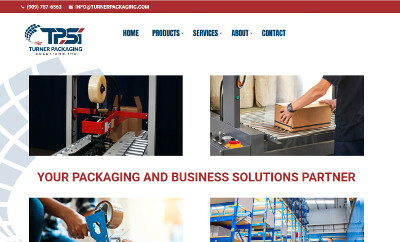 The Turner Packaging Solutions Inc. website is at turnerpackaging.com. A customer reached out to us needing a website created. Him & his son had a great idea to put online – something that they came up with on their own. 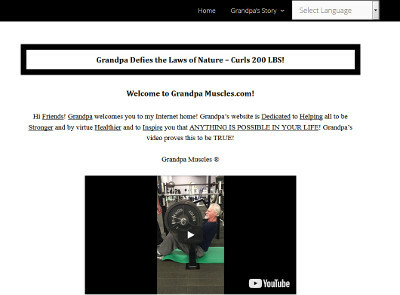 He is known as “grandpa muscles” and he wanted to have a website to sell his information on how he has been able to curl 200 pounds – over his body weight. We got started on the website promptly after the initial payment from them. He had a Word document and wanted the website to look identical to the file he sent. No other bells and whistles – except the ability to have the website be translated into various languages easily, so we integrated the Google Translation capability. The main aspect of the site was for him to tell his story and then lead customers to purchasing his information. Upon payment, customers received an email with a download link to get their download – so nothing needs shipped and it is immediately available to customers. When the majority of the site was done, the customer also mentioned that his son took a video of him curling the weights – and he wanted that to be edited a bit and put on the website as proof. We got the video from Grandpa Muscles and made the requested edits within 48 hours. The website is done and open for business! Christi, the owner of Johnson’s CPR Plus, contacted a couple of weeks ago. She was referred from another one of our customers – Janecia that runs SS Phlebotomy. Janecia had great things to say about us and the support we have provided her with her service needs – so Christi was eager to have us help with her business too. Originally, Christi went to another provider and used their proprietary website builder program. But, it did not turn out like she wanted and she wasn’t happy with how limiting the site was. While we are still working on her website, our logo designer has completed her logo which is shown above. A few changes were done to one of the mock-up designs we created and it was approved quickly thereafter. Johnny contacted us this week needing help with a logo design. He already had the logo created but needed it re-drawn in a vector-grade file so he could use it for printing a sign. Johnny promptly sent us over the logo file we needed. In less than 48 hours, we had the logo re-drawn in Adobe Illustrator, a vector graphic design. We provided him the needed EPS and AI files for his printing company. We appreciate the business from Johnny! John contacted us a few weeks ago asking about our website design services. 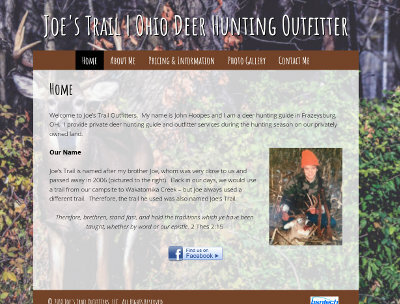 He provides deer hunting guide services in Ohio and wanted to start a site for his service. He just recently retired and was ready to make this his full time job. He requested a few features on his website above and beyond our basic website design services. We added a basic contact form, a picture gallery, one additional web page, and made the site mobile compatible. John sent us the info he wanted on the website fairly quickly and we had it up and running within two days of receiving his info. Over the past few weeks, John was going to get us an updated photo to add to the homepage but he opted to do this later down the road. The website is now up and ready and open for business! The site for Joe’s Trail is at joestrail.com. Tyler reached out to us last week needing a logo created for his business, North Eastern Processing Company. He already had the exact information that he wanted on the logo and it was sent in with his logo design questionnaire. Our graphic designer began working on the logo and completed it within a few days. Several revisions were requested to the logo including font styles, sizes, and moving some of the words around. However, the logo design was completed to Tyler’s satisfaction and it was approved today over the phone when speaking to our graphic designer. Nate, the owner of N8 Scapes, LLC – a lawn and landscaping company – contacted us to create a logo for him. We sent him the information about our logo design service and he was excited to get started. Our logo designer created three initial designs for Nate initially but Nate requested to see a couple more examples. Once the second set were completed, he was very happy with one of the logos we made right away. No other changes or modifications were requested for it. Thank you for your logo design business Nate! Barbara contacted us late last week asking about our logo design services. They already had a logo for their business but over time, the quality of the logo has deteriorated from being copied and scanned several times. Therefore they wanted to have the logo cleaned up again to be made crisp and clean like the original. Our logo designer worked on the logo and duplicated it, although there were some slight differences with the initial draft. Those changes were completed and Barabara approved of the work today. Thank you Barbara for trusting BsnTech Networks with your vector logo design service needs! Skip, the founder of the non-profit Joshua Foundation, had us create a website for him about a month ago for another business. Because of our customer service and pricing, he wanted to have us re-design the website for Joshua Foundation as well. Another company had created a website for them several years back in their proprietary website building platform and Skip was ready to move away from them because of their monthly costs. We gave the website a new and modern look and used the majority of the material from the old website. Skip also needed to have a separate page for the Japanese Mission that would allow someone to login and update that page without having access to the main website, so we put this in place as well. We appreciate the additional business from Skip! 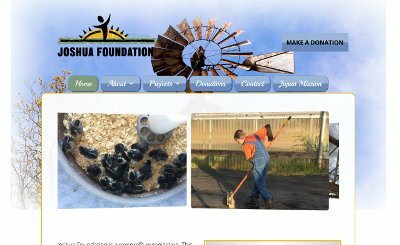 The website for Joshua Foundation, Inc is at joshuafoundation.net.